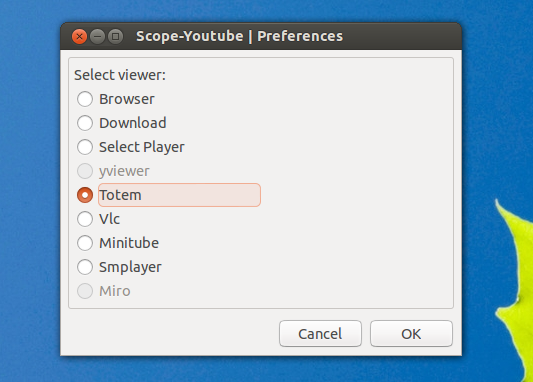 A while back, Lorenzo has created an alternative video lens and YouTube scope for Unity, which can be used to easily search and play YouTube videos using an external player of your choice. Unity in Ubuntu 12.10 does have its own video lens, but it only supports YouTube Shows, Movies and Educations, so most YouTube results won't show up in the default Ubuntu video lens. For those not familiar with this YouTube scope, besides being able to easily search for YouTube videos, it comes with a tool that lets you select an external player for viewing YouTube videos, so you don't have to open your browser (and without Flash). 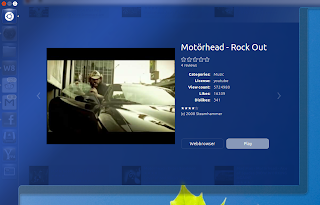 In the latest version, more players are supported and you can download videos as well, feature for which youtube-dl, a command line tool to download YouTube videos, is used. To configure which video player to use for viewing YouTube videos, launch Yavol from Dash (shows up as "yavol-scope-youtube-configurator"). In my test, VLC didn't work properly, so I suggest using something like Totem or Minitube to play the videos.